26 spells too choose from. A 1 mana Unstable Portal with plenty of upside. Unstable portal? There's no cost reduction. You are correct. On the upside, you can pick 1 out of 3. And druid has that ramp thing. I understand that. 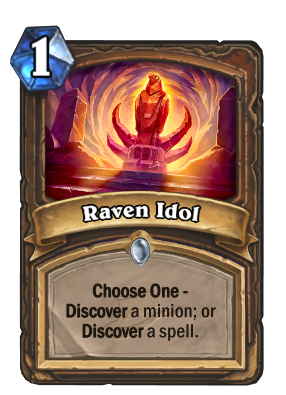 It is similar to unstable portal, but you can choose from 3 minions. How many of those "average" spell cards become bad when you increase the mana cost by one? This is really pay one more mana for a random card. Exactly my line of thought as well. Though the big difference is, it's one more mana for 3 random spells or 3 random minions. The dream scenario is, this card being your "sideboard" picking up what you need for different match-ups. It's not a strong card(if lucky it becomes strong) and can be quite unreliable, though it's a fun card to play I bet. Violet Teacher activator that can give you another activator. Pros: You can get cards from other classes. You do not mill yourself for 3. You can choose spells or minions for a slight hand in the RNG. Cons: You don't draw cards you actually put in your deck. Nope, just spells own hero cards.